Lounging around your swimming pool is one of life’s great pleasures. Relaxing while reading a book, listening to music or taking a swim help melt away any stress you might feel from a busy workday. But if you want to truly transform your outdoor space into an oasis, the options are virtually endless. How about watching your favorite sports team on an outdoor television? Sipping wine next to a roaring fire pit? Grilling steaks at your outdoor kitchen? Or just catching some shut eye in the shade of a poolside cabana? 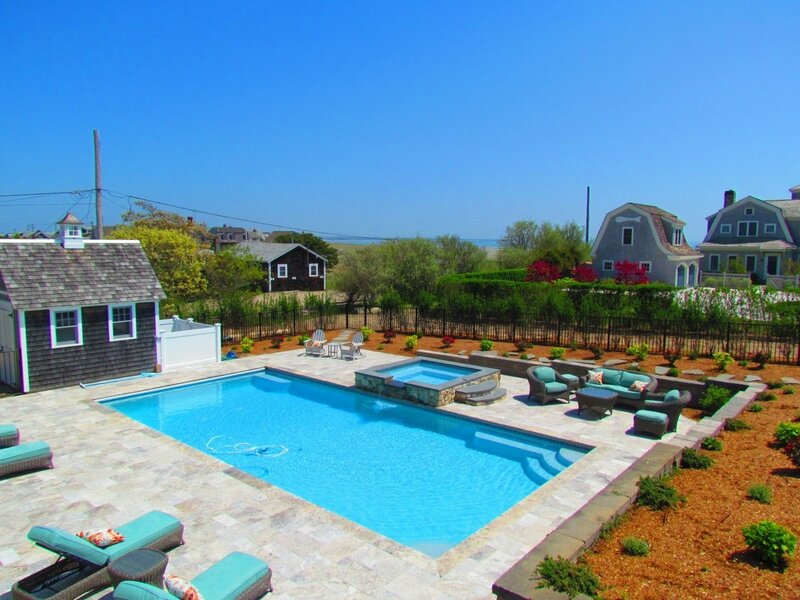 At Shoreline Pools, we will serve as your general contractor to create an outdoor living and entertainment space that will maximize every moment of your time spent at the pool. Let’s face it, pool parties are more fun with your favorite music. We can fill your outdoor space with quality speakers, whether it’s wall-mounted models that hang under the home’s eaves, rock-shaped speakers that blend in with a garden or in-ground speakers. We will also place speakers so that volumes can be adjusted, depending on the location. For the kids frolicking in the pool, turn up the volume. For the adults nearby having a quiet conversation beneath a beautiful cedar pergola, the music plays softly in the background. When it comes to the TV, we’ll make sure you have the right size, along with one that is weather resistant. Even if your TV is covered, it only takes a little rain blown in by wind or a squirt of a hose by the gardener to ruin a standard TV. Even high humidity, especially with salty ocean air, can damage a TV that’s not built to withstand the elements. We’ll also mount the TV so that you can adjust it whenever the sun’s position changes throughout the day. Of course, dining al fresco is truly fun when you bring the entire cooking experience outside. A built-in grille, a sink with hot and cold water, storage cabinets, a wine and beer refrigerator, and a kitchen island with a raised bar area for seating will make you want to prepare every meal by the pool. You could even add a wood-fired pizza oven. There are also many options when it comes to pool seating. In addition to complementing your decor style, chairs should be able to stand up to the elements by repelling water and provide comfort for family and friends. Chaise lounge chairs are stylish and allow you to stretch out, recline or sit up. An elegant rattan sofa can accommodate two or three people. And a rustic wood or glass table and chair set is perfect for meals, setting up your laptop or perhaps working on a jigsaw puzzle. And when the sun goes down and the temperature drops, there’s no need to head indoors when you have a fire pit to provide warmth. Set it up near the cabana and you night never again go indoors.